An infinitesimal dot in a vast space, containing, as the great Carl Sagan once said of another famous image from our exploration of space, the Pale Blue Dot image, every single person you ever knew, your mother, father, brother, your grandfather, his father back to the earliest proto human, every cat, dog, fish, bird, every beggar and king, every famous musician, every humble artisan, all lived on that dot. That’s home. 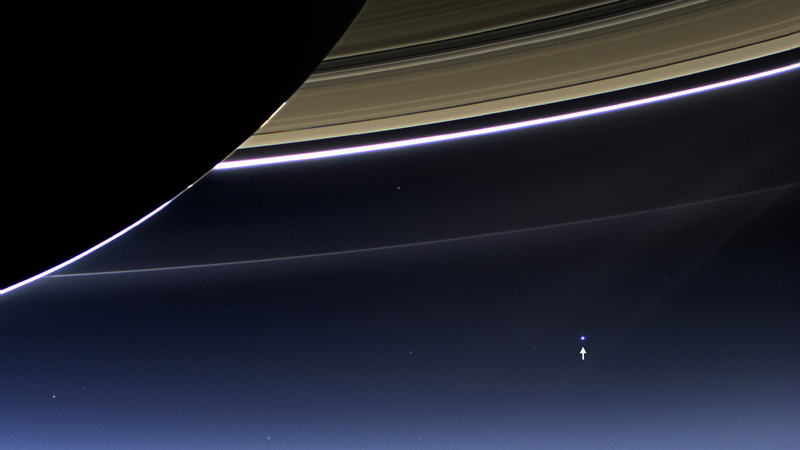 Now Cassini sends us this spectacular image from Saturn, the crown jewel of the solar system, the Earth, a bright, blue dot (arrowed in the pic) glowing in the vast distance, millions of miles away while the magnificent rings of Saturn wheel above. Every person, everything we’ve ever done is on that dot, from the first single celled creatures through the great dinosaurs to us, all contained inside that glowing dot. And yet look at this picture, look at how far we can reach, further than anyone in thousands of years of human history – look at how far we can reach when we put out efforts and those big brains evolution gave us to some wonderful effort instead of squabbling and fighting among ourselves on that same small dot. When we’re not doing that, this is the kind of thing we can accomplish, and it is magnificent. A little reminder as we see endless bad news of wars, disasters, economic ruin and more every night on the news that actually we are remarkable, our species built this clever probe, worked out a complex flight path around celestial bodies at huge speed, swinging around gravity wells and did so with such precision it can send us back images of our own world as seen from the rings of Saturn and we can share it at almost the speed of light through fiber optic networks of computers across that little globe, instantly. “The Earth is the shore of the cosmic ocean. Recently we’ve waded a little way out, and the water seems inviting...” Carl Sagan. This entry was posted in astronomy, science and tagged astronomy, Carl Sagan, Cassini, Earth, NASA, Saturn, science, space exploration by Joe. Bookmark the permalink. This picture reminds me of a Douglas Adams quote. “It’s a microscopic dot within a microscopic dot with a little arrow that says, ‘you are here’ “. Really puts things in perspective.